Energy Future Holdings’ bankruptcy filing last week put to rest another chapter in the book of boom-era PE buyout failures. 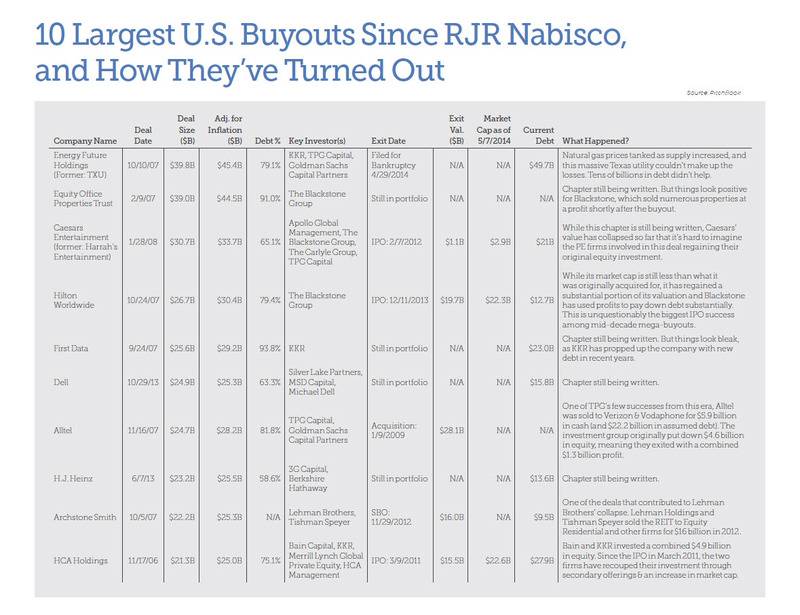 Of the largest buyouts since RJR Nabisco was acquired by KKR back in 1989, Energy Future Holdings, formerly known as TXU, was the largest and biggest failure of them all, having gone down with nearly $50 billion in obligations to its creditors. Others, such as Harrah’s Entertainment (now Caesar’s Entertainment), First Data and Archstone Smith continue to exist, but have either bled money or remained under the pressure of heavy debt loads, creating long-term burdens for their PE backers. The financial crisis obviously played its part in many of these failures, having occurred shortly after the buyout boom of 2005-2007 and diminished values considerably, but the common theme across the board is that these deals were both very large and incorporated very high amounts of debt (see the graphic below for a list of the 10 largest U.S.-based buyouts since RJR Nabisco). Some buyouts that included massive amounts of leverage certainly didn’t fail—and several even succeeded, with many firms recouping their investments due to (ironically) high leverage ratios, allowing firms to put less equity down and increasing the potential for great rewards, as well as firms’ ability to generate returns via dividend recapitalizations and secondary offerings post-IPO. A certain level of frugality during the credit crunch also probably helped save money here and there. But PE firms have no doubt learned their lesson, judging from debt levels for the two largest buyouts since 2008 (at more manageable levels) and a dearth of mega-buyouts since the pre-crisis era. Since 2008, there have only been four buyouts of more than $10 billion, and none of the biggest names in PE have been on the buy-side of them. For a look at what happened in the PE industry this week in history, click here. Instead, firms like KKR, TPG, Blackstone, Carlyle, Apollo, Warburg and Bain, have been acquiring more companies in the $100 million to $500 million range. That size bucket, which represented just 13% of the buyouts those seven firms completed in 2009, comprised 38.6% in 2013 and 54.6% through the first four months of this year. At least two of the firms (Carlyle and TPG) have also expressed their desire to put more capital to work through growth deals. And TPG certainly hasn’t been shy about using this new strategy over the last few months, having recently invested some $1.5B with other firms on PE growth/expansion financings for Chobani, Airbnb and Uber. If PE firms plan on sitting out the large deals over the next few years, where will acquisitions at the high-end happen? Look to Warren Buffett and his business empire, Berkshire Hathaway, which partnered with Brazilian PE firm 3G Capital to acquire H.J. Heinz for $23.2 billion in June last year in the second-largest buyout since the financial crisis. As one of the largest conglomerates in the world with billions in cash ready to be deployed, it’s one of the few entities willing and able to make acquisitions of that size. It will most certainly be Berkshire and firms like it that take on mega-sized deals that PE firms are passing on. Want to learn more about this private equity data? Click here to request a live demo of the PitchBook Platform.